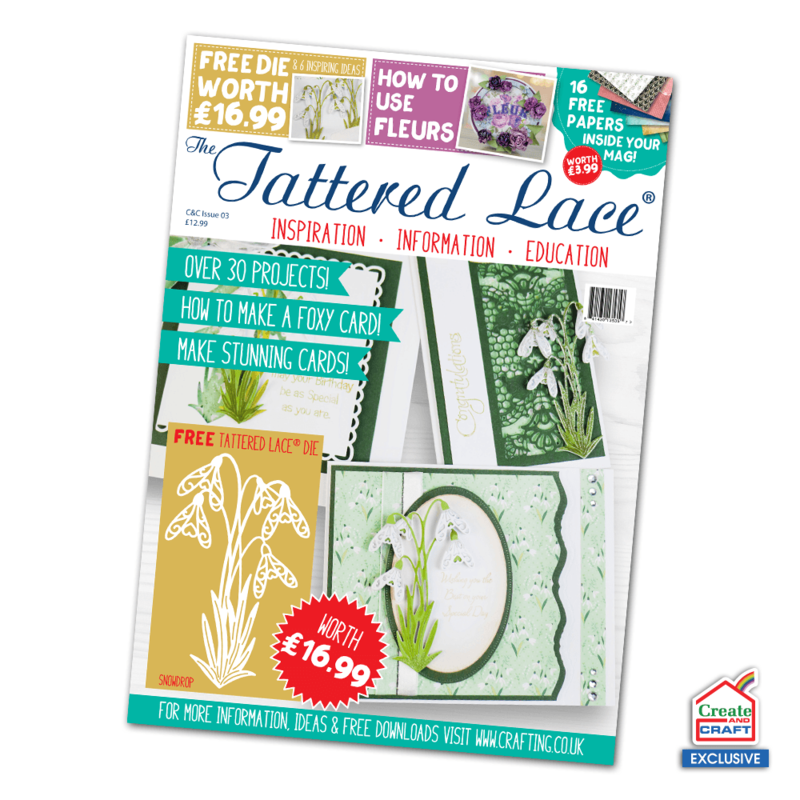 Welcome to the third Create and Craft Special, Tattered Lace Magazine, delighted that you can join us. We’re sure that one of the first things that you did when you received your magazine, was to take the FREE die off the front of the magazine. Isn’t it just lovely?! Snowdrops are the first mutterings of Spring and we love to see them, it means that the days are getting ever so slowly longer and a hint of sunshine is coming our way – hooray! We have six wonderful Snowdrop projects for you to try, or maybe you just want to pick out a little technique from one project and put it together with something else that’s featured in the magazine. So what other delights are there to come? Well there is a little bit of magic and mayhem in the form of the Wondrous Wizard with his little side kick – the Baby Dragon and also the Faerie Wishes and Moonbeam. These cards are fun and will appeal to so many: boys and girls of all ages and of course anybody that loves those stories with a bit of enchantment. We are particularly taken by the Pure Decadence Lady together with the Iconic Deco Card. This elegant era is still such a pleaser, we see it on the TV and in the High Street, the projects are just stunning and very clever. Talking of clever, the Circle Jigsaw makes some charming cards, including using jigsaw pieces as a stopper for an easel card. We have some superb, non-card, projects with the Steampunk Owl. These plaques would make great gifts as well as something to adorn the home with your own creations. You could also use the sentiments dies for home décor as well. My favourite is Friends are like Stars. Don’t forget to have a look at the Fleurs feature and learn how to make the most beautiful paper flowers.